Mounting electrophysiological evidence indicates that certain general anesthetics, volatile anesthetics in particular, depress excitatory synaptic transmission by presynaptic mechanisms. We studied the effects of representative general anesthetics on voltage-gated Na+ currents (INa) in nerve terminals isolated from rat neurohypophysis using patch-clamp electrophysiological analysis. Both isoflurane and propofol inhibited INa in a dose-dependent and reversible manner. At holding potentials of -70 or -90 mV, isoflurane inhibited peak INa with IC50 values of 0.45 and 0.56 mM, and propofol inhibited peak INa with IC50 values of 4.1 and 6.0 μM, respectively. Isoflurane (0.8 mM) did not significantly alter the V1/2 of activation; propofol caused a small positive shift. Isoflurane (0.8 mM) or propofol (5 μM) produced a negative shift in the voltage dependence of inactivation. Recovery of INa from inactivation was slower from a holding potential of -70 mV than from -90 mV; isoflurane and propofol further delayed recovery from inactivation. In conclusion, the volatile anesthetic isoflurane and the intravenous anesthetic propofol inhibit voltage-gated Na+ currents in isolated neurohypophysial nerve terminals in a concentration- and voltage-dependent manner. Marked effects on the voltage dependence and kinetics of inactivation and minimal effects on activation support preferential anesthetic interactions with the fast inactivated state of the Na+ channel. These results are consistent with direct inhibition of oxytocin and vasopressin release from the neurohypophysis by isoflurane and propofol. Inhibition of voltage-gated Na+ channels may contribute to the presynaptic effects of general anesthetics on nerve terminal excitability and neurotransmitter release. The mechanisms by which general anesthetics produce the triad of unconsciousness, amnesia and immobility have yet to be defined despite over a century of research. Depression of excitatory transmission and/or facilitation of inhibitory transmission are the principal neurophysiological effects of general anesthetics on synaptic transmission, but the cellular and molecular targets for these actions have not been established (Perouansky and Hemmings, 2003). Considerable evidence indicates that potentiation of GABAA receptors is involved in the facilitation of inhibitory transmission by anesthetics (Yamakura et al., 2001). General anesthetics also modulate other members of the ligand-gated ion channel superfamily, including neuronal nicotinic acetylcholine receptors and N-methyl-d-aspartate-type glutamate receptors (Yamakura et al., 2001). General anesthetics also affect voltage-gated Na+, K+, and Ca2+ channels (Topf et al., 2003), cell signaling mechanisms such as protein kinase C (Hemmings, 1998) and G protein-coupled receptor pathways (Ishizawa et al., 2002), vesicular exocytotic mechanisms (van Swinderen et al., 1999), and transmitter uptake mechanisms (Shahani et al., 2002). The contributions of these and possibly other targets to the synaptic actions of general anesthetics have not been clearly defined. Mounting electrophysiological evidence indicates that general anesthetics depress excitatory synaptic transmission by presynaptic mechanisms (MacIver et al., 1996; Kirson et al., 1998; Perouansky and Hemmings, 2003). At the neurochemical level, volatile anesthetics and propofol inhibit depolarization-evoked glutamate release from isolated rat cortical nerve terminals (Schlame and Hemmings, 1995; Lingamaneni et al., 2001). To investigate the possible ion channel targets for these presynaptic actions, we used isolated rat neurohypophysial (NHP) nerve terminals as a system amenable to patch-clamp electrophysiological analysis. Nerve terminals from supraoptic and periventricular magnocellular neurons terminate in the neurohypophysis and contain large dense-core synaptic vesicles filled with oxytocin or arginine vasopressin. These nerve terminals are of sufficient size (5–16 μm in diameter) for patch-clamp analysis (Lemos and Nordmann, 1986). Previous studies indicate that NHP nerve terminals express voltage-gated Na+, K+, and Ca2+ channels, which are involved in the control of nerve terminal excitability and peptide release (Lemos and Nowycky, 1989; Bielefeldt et al., 1992; Lindau et al., 1992; Turner and Stuenkel, 1998; Wang et al., 1999). 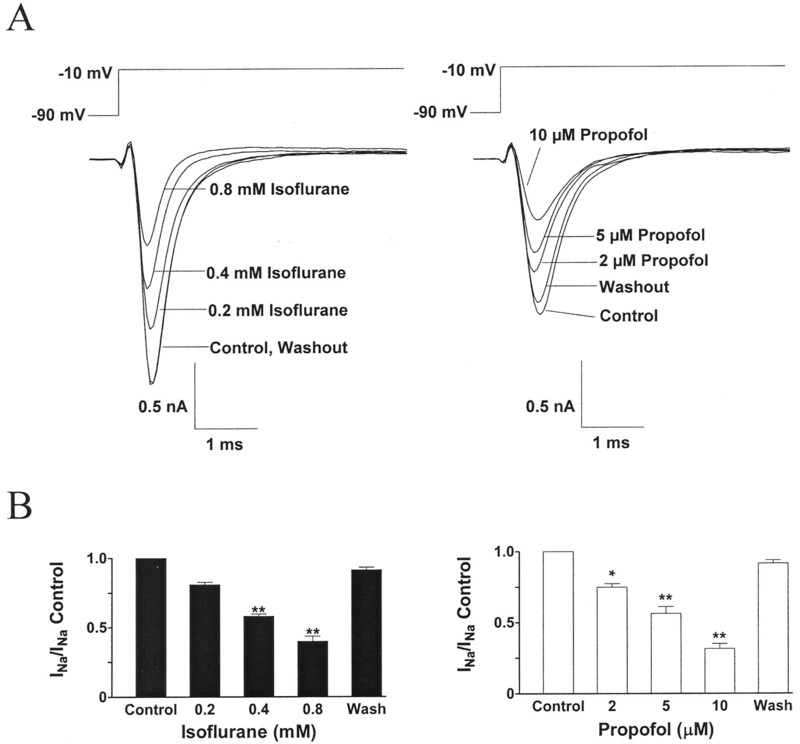 We now report that the widely used general anesthetics isoflurane and propofol at clinically relevant concentrations inhibit voltage-gated Na+ channels in isolated NHP nerve terminals. Materials. Isoflurane was obtained from Abbott Laboratories (North Chicago, IL) and propofol from Sigma-Aldrich (St. Louis, MO). Amphotericin B, tetraethylammonium chloride, and tetrodotoxin were purchased from Sigma-Aldrich. Male Sprague-Dawley rats (260–300 g) were from Charles River Laboratories, Inc. (Wilmington, MA). Nerve Terminal Preparation. Experimental protocols were approved by the Institutional Animal Care and Use Committee of Weill Medical College of Cornell University. NHP terminals were prepared as described previously (Wang et al., 1999) with minor modifications. Male Sprague-Dawley rats were anesthetized with 80% CO2, 20% O2 and decapitated; this technique avoids hypoxemia and exposure to clinically used anesthetic drugs (H. C. Hemmings, Jr., unpublished observations). The neurohypophysis was separated from pars anterior and pars intermedia of the pituitary, and gently homogenized in a solution containing 270 mM sucrose, 10 mM HEPES-Tris, and 0.01 mM K-EGTA, pH 7.25, using a 0.5-ml Teflon/glass homogenizer. The NHP homogenate was pipetted into a plastic Petri dish (35 × 10 mm) and allowed to settle for 5 to 8 min. The Petri dish with dissociated NHP nerve terminals was placed onto the stage of an ECLIPSE TE300 inverted microscope (Nikon, Melville, NY) equipped with interference contrast optics (Hoffmann, Melville, NY) and super-fused (2–3 ml/min) with Locke's solution consisting of 145 mM NaCl, 5 mM KCl, 2.2 mM CaCl2, 1 mM MgCl2, 10 mM Na-HEPES, and 15 mM d-glucose, pH 7.30. Each preparation contained many structures less than 3 μm in diameter, as well as a small number of terminals with diameters of 5 to 16 μm. Terminals were identified by their bright refraction, smooth spherical shape, and absence of a nucleus. Isolated NHP terminals were readily distinguished from pars intermedia cells, which are larger and nucleated. In the present study, we selected terminals of 5- to 10-μm diameter because of their relative abundance and space clamp characteristics for Na+ current recording. Electrophysiological Recording. Recording pipettes (tip diameter <1 μm) were made from borosilicate glass capillaries (Drummond Scientific, Broomall, PA) using a micropipette puller (Sutter Instruments, Novato, CA) and fire polished (Narishige Microforge, Kyoto, Japan). The perforated patch-clamp technique (Wang et al., 1999) was used to record Na+ currents at room temperature (23–25°C). Terminals with access resistances of <10 MΩ were selected for study. Pipettes were filled with a solution containing amphotericin B (240–300 μg/ml) in 145 mM Cs-glutamate, 2 mM CaCl2, 1 mM MgCl2, 10 mM HEPES, 5 mM d-glucose, and 10 mM tetraethylammonium chloride, pH 7.25. Capacitance and 60 to 80% series resistance were compensated. Whole-terminal currents were sampled at 10 kHz and filtered at 1 to 3 kHz using an Axon 200B amplifier and pClamp 8 software (Axon Instruments, Inc., Burlingame, CA). Locke's solution perfused the chamber at 0.10 to 0.15 ml/min. Anesthetics were introduced from glass syringes and applied locally to attached terminals at 0.05 ml/min through a 0.15-mm-diameter perfusion pipette (30–40 μm away from patched terminals) using an ALA-VM8 pressurized perfusion system (ALA Scientific, Westbury, NY). Isoflurane and propofol were diluted into Locke's solution from stock solutions (10–12 mM isoflurane in Locke's solution, prepared 12–24 h before experiments; or 10 mM propofol in dimethyl sulfoxide). Concentrations of isoflurane or propofol in the recording chamber were determined by local sampling of the perfusate at the site of the recording pipette tip and analysis by gas chromatography (Ratnakumari and Hemmings 1998) or high-performance liquid chromatography (Lingamaneni et al., 2001), respectively. Data Analysis. IC50 values were obtained by least-squares fitting of data to the Hill equation: Y = 1/(1 + 10[(log IC50 - X) × nH]), where X is the concentration, Y is the response, and nH is the Hill slope. Activation curves were fitted to a Boltzmann equation of the form G/Gmax = 1/[1 + e(V1/2 - V)/k], where G/Gmax is the normalized fractional conductance, Gmax is the maximum conductance, V1/2 is the voltage for half-maximal activation, and k is the slope factor. Na+ conductance (GNa) was calculated using the equation GNa = INa/(Vt - Vr), where INa is the peak Na+ current, Vt is the test potential, and Vr is the Na+ reversal potential (ENa = 67 mV). Steady-state inactivation curves were fitted to a Boltzmann equation of the form I/Imax = 1/(1 + e(V1/2 - V)/k), where I/Imax is the normalized current, Imax is the maximum current, V1/2 is the voltage of half-maximal inactivation, and k is the slope factor. Data for INa recovery from inactivation were fitted to a single exponential rising function of the form I/Imax = 1 - A e(-t/τ), where I/Imax is the normalized current, A is the amplitude, τ is the time constant for INa recovery, and t is the interpulse interval. Data were analyzed using pClamp 8 (Axon Instruments, Inc.), Prism 3.02 (GraphPad Software Inc., San Diego, CA) and SigmaPlot 6.0 (SPSS Science, Chicago, IL). Data are expressed as mean ± S.E.M. Statistical significance was assessed by ANOVA or paired or unpaired t test, as appropriate; p < 0.05 was considered statistically significant. Basic Properties of INa. Representative Na+ current traces determined in neurohypophysial terminals (5–10 μm diameter) using the perforated patch-clamp recording technique are shown in Fig. 1. The perforated-patch technique was used because conventional whole-terminal patch recording led to greater rundown of Na+ current (data not shown) and this complicated repeated measurements essential to pharmacological analysis. We took two measures to improve space clamp conditions for Na+ current recording using the perforated-patch method: 1) relatively small nerve terminals were selected for recording and 2) larger pipette tips were used. A, representative INa traces in a neurohypophysial terminal (8 μm) using the perforated-patch-clamp technique. B, voltage-activated INa was inhibited completely by tetrodotoxin. Voltage-activated Na+ currents were blocked completely by 0.5 μM tetrodotoxin (Fig. 1). INa amplitudes evoked from a holding potential of -90 mV (conventionally used to fully activate Na+ current) were larger compared with a holding potential of -70 mV (closer to physiological resting potential) because fewer channels are in the inactivated state at -90 mV (Ruben et al., 1992). At a holding potential of -90 mV, mean peak INa amplitude was -1370 ± 380 pA (n = 57); at a holding potential of -70 mV, mean peak INa amplitude was -1090 ± 210 pA (n = 39). Anesthetic Effects on Peak INa. Isoflurane and propofol inhibited INa in a reversible and dose-dependent manner (Fig. 2). Onset of inhibition of INa by isoflurane or propofol was rapid (less than 1 min of application) and rapidly reversed upon washing (within 1 min) using focal pipette perfusion of the patched terminals (data not shown). In the presence of 0.4 or 0.8 mM isoflurane, peak INa amplitude was reduced to 58 ± 2% (p < 0.01) and 39 ± 4% (p < 0.01) of control, respectively. In the presence of 2 or 5 μM propofol, peak INa amplitude was reduced to 75 ± 3% (p < 0.05) and 56 ± 5% (p < 0.01) of control, respectively (Fig. 2B). Reversible inhibition of INa by isoflurane and propofol in neurohypophysial terminals. A, representative current traces from two terminals. B, concentration-dependent inhibition of peak INa by isoflurane or propofol. Data are shown as mean ± S.E.M. (n = 7–13). Washout data were obtained 2 min after a 0.5-min exposure to 0.8 mM isoflurane or 10 μM propofol. *, p < 0.05 versus control; **, p < 0.01 versus control, by ANOVA with Dunnett's post hoc test. Holding potential -90 mV, 25-ms test potential to -10 mV. From a holding potential of -90 mV, peak INa activation was elicited at -10 mV (Fig. 3A). Low concentrations of either anesthetic had minimal effects on the current-voltage (I-V) relationship, other than reductions in peak INa amplitude. At holding potentials of -70 or -90 mV, IC50 values for peak INa inhibition by isoflurane were 0.45 and 0.56 mM (Fig. 3B) with Hill slopes of 1.7 and 1.8, respectively. At holding potentials of -70 or -90 mV, IC50 values for propofol were 4.1 and 6.0 μM (p < 0.01) with Hill slopes of 1.6 and 1.8, respectively. These results indicate slightly more potent inhibition of INa at physiological resting membrane potential. The effects of both drugs were well fitted by the Hill equation with efficacies of 100% inhibition. Both anesthetics were effective at concentrations observed during clinical anesthesia: the EC50 for general anesthesia for isoflurane is 0.35 mM (Taheri et al., 1991) and for propofol is 2.2 μM (Tonner et al., 1992). 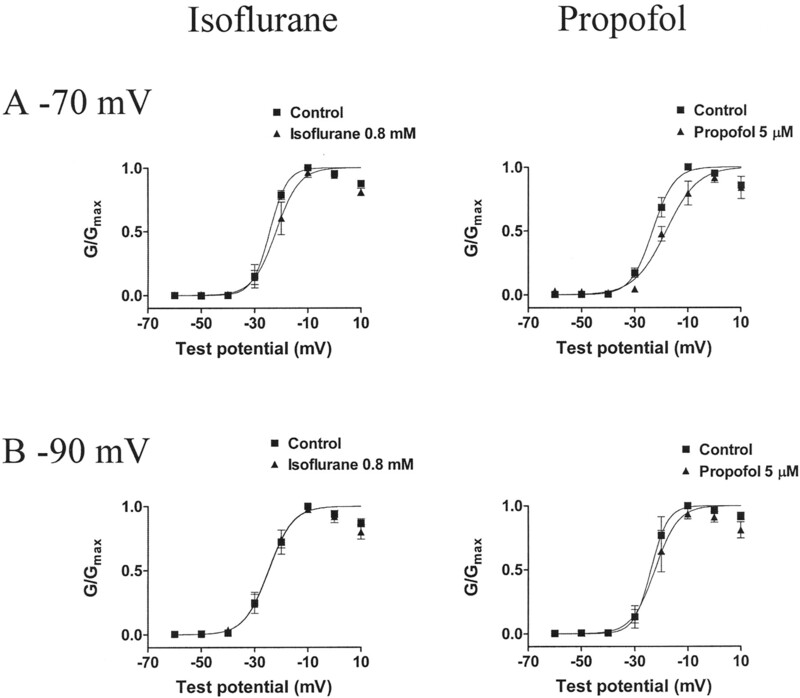 A, effects of isoflurane or propofol on representative I-V relationships of INa in isolated neurohypophysial terminals. Holding potential -90 mV, 25-ms test potential from -60 to +30 mV in 10-mV increments. B, concentration-effect curves for inhibition of peak INa by isoflurane or propofol. Data (mean ± S.E.M. ; n = 6–9) were fitted to the Hill equation. Currents elicited from a holding potential of -70 mV were more sensitive to propofol than those elicited from -90 mV (*, p < 0.01 by unpaired t test). Anesthetic Effects on INa Activation and Inactivation. The effects of anesthetics on the voltage dependence of Na+ channel activation are shown in Fig. 4. Isoflurane (0.8 mM) did not significantly alter the V1/2 of activation of Na+ conductance from holding potentials of -70 or -90 mV, consistent with no shift in the I-V curve (Fig. 3A). At a holding potential of -70 mV, 5 μM propofol produced a slight positive shift in the activation curve (p < 0.05, n = 5; Table 1), consistent with the small shift in the I-V curve apparent from -90 mV at 10 μM propofol (Fig. 3A). Both anesthetics slightly increased the slope factor (k) at -70 mV, and propofol also increased the slope factor at -90 mV. 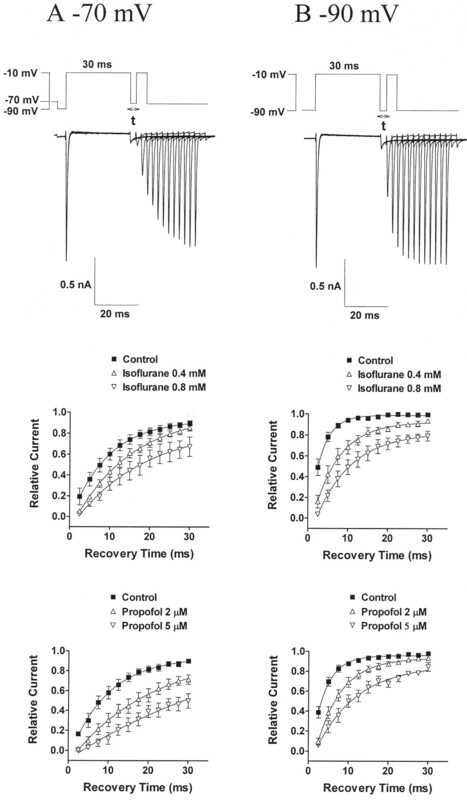 Effects of isoflurane (left) or propofol (right) on the voltage dependence of activation of peak INa in neurohypophysial terminals from holding potentials of -70 mV (A) or -90 mV (B). Data shown as mean ± S.E.M. (n = 5–9). Steady-state inactivation curves for INa in the absence or presence of anesthetics were determined with standard two-pulse protocols (Figs. 5 and 6). Isoflurane (0.8 mM) produced a negative shift in the voltage dependence of inactivation with no effect on the slope factor (Table 1). Propofol (5 μM) produced a negative shift in the voltage dependence of inactivation and increased the slope factor (Table 1). Although not statistically significant, isoflurane and propofol had greater effects on inactivation curves when using a short (30 ms) compared with a long prepulse protocol (Fig. 6; Table 1). These observations are consistent with drug binding to and stabilization of the inactivated state of Na+ channels. 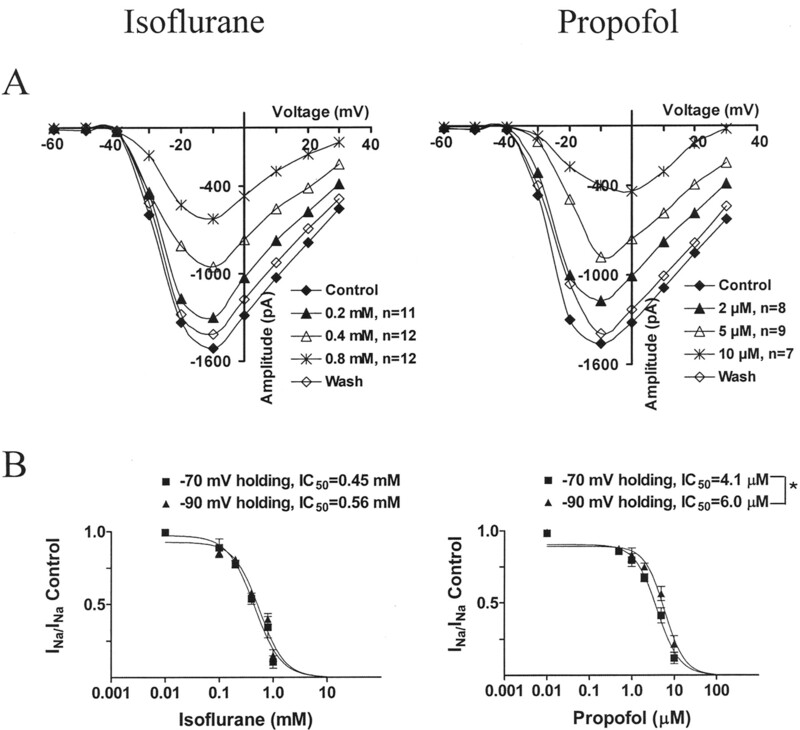 Representative traces showing effects of isoflurane (left) and propofol (right) on INa inactivation in neurohypophysial terminals. Effects of isoflurane and propofol on INa inactivation curves with short (800 ms; A and B) and long (30 ms; C and D) prepulses. Currents were elicited by a 25-ms test pulse to -10 mV after a pre-pulse ranging from -130 or -120 mV to 0 mV in 10-mV increments. Data shown as mean ± S.E.M. (n = 4–6). **, p < 0.01 by unpaired t test. Anesthetic Effects on INa Recovery from Inactivation. The kinetics of INa recovery from the inactivated state are crucial in regulating NHP terminal excitability and repetitive firing, and hence neuropeptide release. Inactivation was investigated using a standard two-pulse protocol with varying interpulse intervals from holding potentials of -70 or -90 mV (Fig. 7). INa recovery from inactivation was fitted by a single exponential function. Recovery was slower from a holding potential of -70 mV and was further slowed by application of isoflurane or propofol (Fig. 7; Table 2). Propofol had a greater effect on recovery from inactivation from a holding potential of -70 mV compared with -90 mV, whereas isoflurane had similar effects at either potential (Table 2). 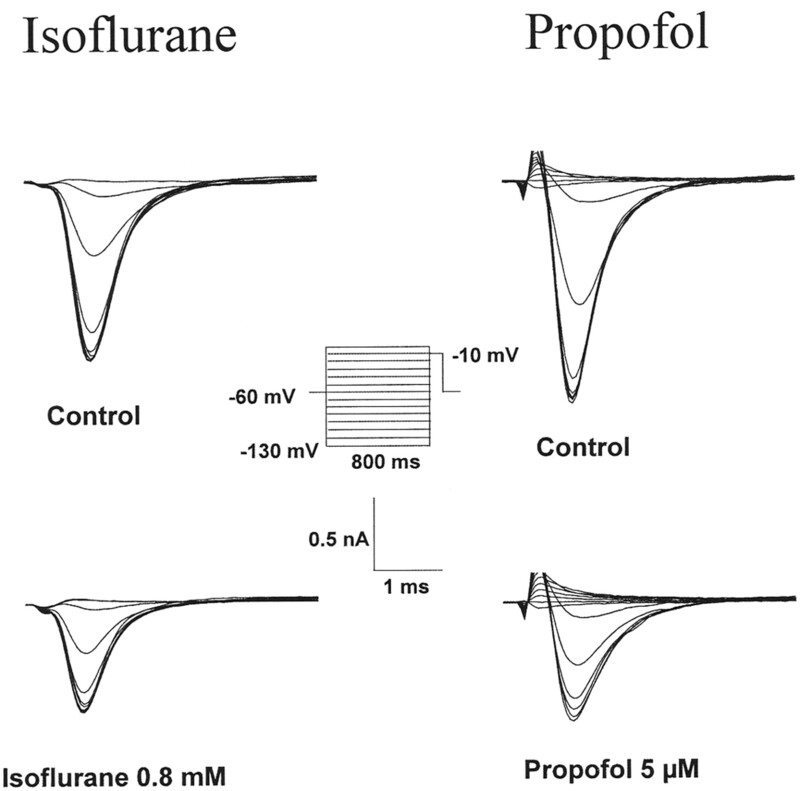 The slower rate of recovery from inactivation in the presence of propofol suggests slower dissociation of propofol from inactivated channels compared with isoflurane. Effects of isoflurane or propofol on the recovery from inactivation of INa at holding potentials of -70 mV (A) or -90 mV (B). Test pulses (5 ms) followed a 30-ms conditioning step to -10 mV with recovery times (t) of 2.5 to 30 ms. Relative currents were calculated as peak INa elicited by test pulse versus that elicited by conditioning pulse from -90 mV in each sweep; these values were normalized to control values in the absence of anesthetics. Data shown as mean ± S.E.M. (n = 5–8). 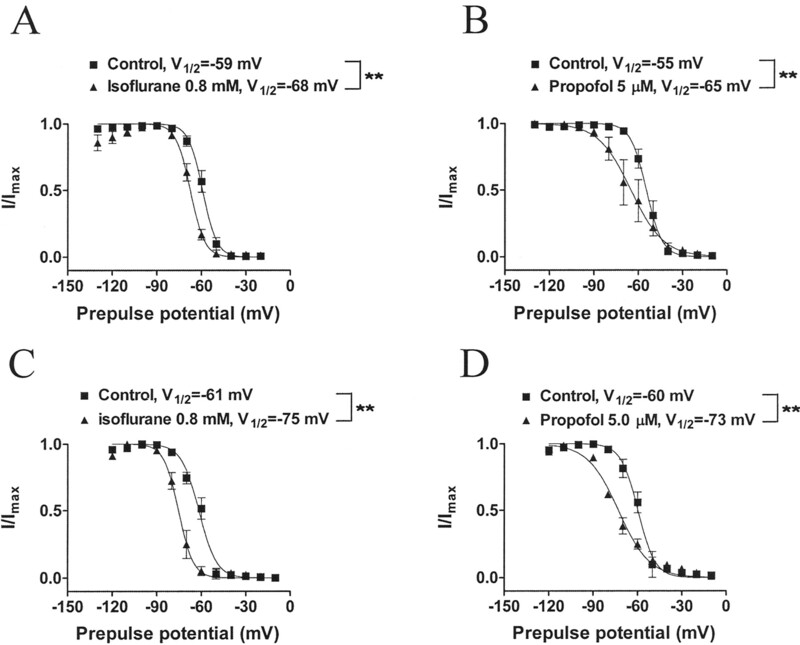 The structurally distinct general anesthetics isoflurane and propofol inhibited voltage-gated Na+ currents in isolated neurohypophysial nerve terminals in a concentration- and voltage-dependent manner. Both anesthetics blocked nerve terminal voltage-gated Na+ currents at concentrations observed during clinical anesthesia. Inhibition was more potent from a holding potential of -70 mV, a physiological resting membrane potential, than from -90 mV. This is consistent with the marked effects of both anesthetics on the voltage dependence and kinetics of Na+ channel inactivation. The actions of isoflurane and propofol on INa varied with holding potential. The V1/2 of activation was shifted slightly in a positive direction by propofol at a holding potential of -70 mV (by ∼5 mV), but isoflurane had no significant effect on V1/2 of activation. The V1/2 of inactivation was consistently shifted in a negative direction by both isoflurane (-8 mV for 800-ms prepulse protocol; -14 mV for 30-ms prepulse protocol) and propofol (-11 mV for 800-ms prepulse protocol; -14 mV for 30-ms prepulse protocol). Both anesthetics also delayed recovery from inactivation. These results suggest that anesthetics exert distinct effects on Na+ channel gating, which may involve multiple target sites on Na+ channels and/or on their modulators. Inhibition of Na+ currents by isoflurane is caused by enhanced channel inactivation, whereas inhibition by propofol can be attributed primarily to enhanced inactivation with some contribution of less effective activation apparent at higher concentrations. The greater effects of isoflurane and propofol on inactivation after a short prepulse (30 ms), which induces mainly fast inactivation, suggest that these general anesthetics primarily affect fast inactivation, as do the local anesthetics (Ragsdale et al., 1994). The marked effects of isoflurane and propofol on channel inactivation are consistent with greater anesthetic affinity for the inactivated state of the channel, analogous to the actions of local anesthetics and anticonvulsants (Catterall, 2002). The slowed rate of recovery from inactivation may reflect either slow anesthetic dissociation from the inactivated or resting state or slowed conversion of channels from the inactivated to resting states. The interaction between a drug and its receptor involves a specific intermolecular interaction that yields a sigmoidal concentration-effect response curve with a Hill slope related to the stoichiometry of the interaction. Despite efforts to obtain satisfactory space-clamp conditions for Na+ current recording using the perforated-patch method, atypically steep activation of Na+ current was observed in some recordings. Such imperfect voltage control would tend to increase the steepness of the concentration-effect curves, which would lead to artificially high Hill slope values. This limitation makes it difficult to infer the stoichiometry of the interaction of general anesthetics with the Na+ channel from Hill slope values alone. Thermodynamic parameters of the binding equilibrium of general anesthetics to Na+ channels could provide more detailed information on binding interactions. For example, the temperature dependence of binding of anesthetics could be analyzed using van't Hoff plots made by comparing IC50 values at various temperatures. However, such experiments in this preparation are limited by the instability of isolated nerve terminals at temperatures above 25°C. Voltage-gated Na+ channels are hetero-oligomers composed of α, β1, and β2 subunits. At least nine different Na+ channel α subunit isoforms have been cloned and identified in human and rat: Nav1.1, Nav1.2, Nav1.3, and Nav1.6 are expressed in the central nervous system; Nav1.7, Nav1.8, and Nav1.9 are expressed in the peripheral nervous system; and Nav1.4 and Nav1.5 are expressed in skeletal and cardiac muscle, respectively (Goldin, 2002). The α subunit alone is sufficient to produce functional channels (Catterall, 2002); it contains four homologous domains, each containing six transmembrane segments. Local anesthetics bind to receptor sites in segment S6 of domains III (Catterall, 2002) and IV (Ragsdale et al., 1994; Catterall, 2002). The intracellular loop between domains III and IV may function as the inactivation gate to mediate fast inactivation. Transmembrane segment S6 in domain I also contributes to the local anesthetic binding site (Yarov-Yarovoy et al., 2002). Our findings that general anesthetics shift the steady-state inactivation curve toward more negative membrane potentials and slow recovery from inactivation support an interaction with the inactivated state of the Na+ channel similar to that of local anesthetics. Whether general anesthetics also interact with segment S6 will require further investigation. A voltage sensor characterized by a series of positively charged amino acids in segment S4 is critically involved in Na+ channel activation (Catterall, 2002; Goldin et al., 2002). The actions of isoflurane on the voltage dependence of activation were unremarkable, and the small effect of propofol was evident only at a holding potential of -70 mV. In a previous report, volatile anesthetics shifted the voltage dependence of both activation and steady-state inactivation of cardiac Na+ currents toward more hyperpolarized potentials (Weigt et al., 1997). This may represent a subtle difference in anesthetic actions on neuronal (Nav1.2, Nav1.3, and Nav1.6) versus cardiac (Nav1.5) voltage-gated Na+ channels. In an influential review, Franks and Lieb (1994) concluded that effects of general anesthetics on voltage-gated ion channels occurred only at concentrations irrelevant to clinical anesthesia. This conclusion was based largely on studies conducted in molluscan axons (Haydon and Urban, 1983) and has not been supported by more recent studies of mammalian Na+ channels. Thus, isoflurane (IC50 = 0.85 mM at -120 mV holding potential; Rehberg et al., 1996) and propofol (IC50 = 25.4 μM at -120 mV holding potential; Rehberg and Duch, 1999) inhibited cloned rat brain (type IIa) Na+ channel α subunits (Nav1.2) heterologously expressed in Chinese hamster ovary cells; both anesthetics also shifted the voltage dependence of inactivation in a negative direction and delayed recovery from inactivation. The IC50 values for inhibition of peak INa by isoflurane and propofol in NHP terminals reported here are lower than those reported for the isolated Nav1.2 α subunit. These differences suggest possible effects of specific Na+ channel isoforms, post-translational modification, and/or the presence of auxiliary subunits on Na+ channel sensitivity to anesthetics. For example, β subunit coexpression increases local anesthetic sensitivity of heterologously expressed rat Nav1.2 α subunits (Bonhaus et al., 1996). We previously reported indirect neurochemical evidence that volatile anesthetics and propofol inhibit presynaptic Na+ channels and Na+ channel-dependent glutamate release in isolated rat cerebrocortical nerve terminals (Schlame and Hemmings, 1995; Ratnakumari et al., 2000; Lingamaneni et al., 2001; Westphalen and Hemmings, 2003). Volatile anesthetics also inhibit voltage-gated Na+ currents in isolated rat dorsal root ganglion neurons (Ratnakumari et al., 2000). We now provide direct evidence that isoflurane and propofol block voltage-gated Na+ channels in nerve terminals at concentrations achieved clinically during general anesthesia. In a study of nerve terminals isolated from rat cerebral cortex, potency of isoflurane for inhibition of veratridine-evoked glutamate release (IC50 = 0.41–0.50 mM) was comparable with that for inhibition of NHP Na+ channels, whereas propofol was more potent in inhibiting NHP Na+ channels than glutamate release (IC50 = 11–18 μM; Lingamaneni et al., 2001). This difference may be caused by effects of Na+ channel modification by veratridine, the presence of different Na+ channel isoforms in cerebral cortex, and/or effects of different modulator proteins or signaling pathways on sensitivity to isoflurane versus propofol. 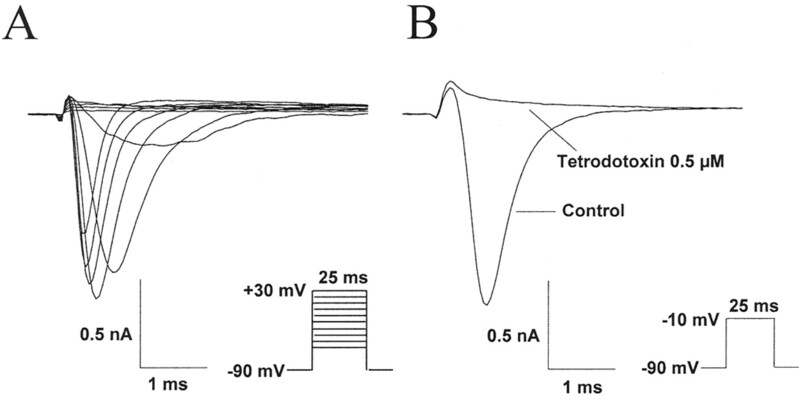 Voltage-gated Na+ channels are essential to the generation and propagation of action potentials (Catterall, 2002) and for nerve terminal depolarization leading to activation of voltage-gated Ca2+ channels, Ca2+ entry, and Ca2+-dependent neurotransmitter release from nerve terminals (Tibbs et al., 1989). Depolarization results in Na+ influx and increases in [Na+]i in neurohypophysial nerve terminals (Turner and Stuenkel, 1998), which is also an important factor in the control of NHP peptide secretion (Toescu and Nordmann, 1991). Increases in [Na+]i can elicit Ca2+-independent vasopressin release from NHP nerve terminals (Stuenkel and Nordmann, 1993); this may be an important alternative pathway to the Ca2+-dependent vesicular release pathway coupled to voltage-gated Ca2+ channel activation (Lee et al., 1992; Lindau et al., 1992). Inhibition of voltage-gated Na+ channels is predicted to inhibit transmitter release by both pathways. Ethanol has been shown to inhibit peptide release and voltage-gated Ca2+ channels in isolated rat NHP terminals (Wang et al., 1991). Our evidence suggests that general anesthetics exert a direct inhibitory effect on NHP terminal excitability and presumably peptide release. Future studies will investigate the effects of anesthetics on Ca2+-dependent versus Ca2+-independent peptide release and the possible involvement of voltage-gated Ca2+ channels. Inhibition of synaptic transmission by general anesthetics (Wakasugi et al., 1999) may result from depressed action potential firing (Antkowiak, 1999) or nerve terminal excitability caused by inhibition of presynaptic Na+ channels. Although the Na+ channel subtype(s) present in NHP nerve terminals has not been identified, native channels seem to be somewhat more sensitive to anesthetics than heterologously expressed rat brain Nav1.2 α subunits. Magnocellular neurons in the supraoptic nucleus, which send axons to the neurohypophysis, express both Nav1.2 and Nav1.6 (α-II and α-Na6) and βI and βII subunits (Tanaka et al., 1999), which suggests that these isoforms may also be the isoforms present in NHP nerve terminals. Postsynaptic ligand-gated ion channels such as GABAA receptors and/or N-methyl-d-aspartate receptors participate in the actions of most general anesthetics (Yamakura et al., 2001). The presynaptic effects of general anesthetics on neurotransmitter release are gaining recognition for their role in the synaptic actions of general anesthetics (Richards, 1998; Perouansky and Hemmings, 2003). Our data support previous findings that general anesthetics influence synaptic transmission via presynaptic mechanisms, specifically via inhibition of presynaptic voltage-gated Na+ channels through enhanced inactivation. We thank Drs. E. Recio-Pinto (New York University, New York, NY) and G. Dayanithi (University of Montpellier II, Montpellier, France) for helpful discussions. This work was supported by National Institutes of Health grant GM58055. ABBREVIATIONS: NHP, neurohypophysial; ANOVA, analysis of variance; I-V, current-voltage. Antkowiak B (1999) Different actions of general anesthetics on the firing patterns of neocortical neurons mediated by the GABAA receptor. Anesthesiology 91: 500–511. Bielefeldt K, Rotter JL, and Jackson MB (1992) Three potassium channels in rat posterior pituitary nerve terminals. J Physiol (Lond) 458: 41–67. Bonhaus DW, Herman RC, Brown CM, Cao Z, Chang LF, Loury DN, Sze P, Zhang L, and Hunter JC (1996) The β1 sodium channel subunit modifies the interactions of neurotoxins and local anesthetics with the rat brain IIA α sodium channel in isolated membranes but not in intact cells. Neuropharmacology 35: 605–613. Catterall WA (2002) Molecular mechanisms of gating and drug block of sodium channels. Novartis Found Symp 241: 206–218; discussion 218–232. Franks NP and Lieb WR (1994) Molecular and cellular mechanisms of general anaesthesia. Nature (Lond) 367: 607–614. Goldin AL (2002) Evolution of voltage-gated Na+ channels. J Exp Biol 205: 575–584. Haydon DA and Urban BW (1983) The effects of some inhalation anaesthetics on the sodium current of the squid giant axon. J Physiol (Lond) 341: 429–439. Hemmings HC Jr (1998) General anesthetic effects on protein kinase C. Toxicol Lett 100–101: 89–95. Ishizawa Y, Pidikiti R, Liebman PA, and Eckenhoff RG (2002) G protein-coupled receptors as direct targets of inhaled anesthetics. Mol Pharmacol 61: 945–952. Kirson ED, Yaari Y, and Perouansky M (1998) Presynaptic and postsynaptic actions of halothane at glutamatergic synapses in the mouse hippocampus. Br J Pharmacol 124: 1607–1614. Lee CJ, Dayanithi G, Nordmann JJ, and Lemos JR (1992) Possible role during exocytosis of a Ca2+-activated channel in neurohypophysial granules. Neuron 8: 335–342. Lemos JR and Nordmann JJ (1986) Ionic channels and hormone release from peptidergic nerve terminals. J Exp Biol 124: 53–72. Lemos JR and Nowycky MC (1989) Two types of calcium channels coexist in peptide-releasing vertebrate nerve terminals. Neuron 2: 1419–1426. Lindau M, Stuenkel EL, and Nordmann JJ (1992) Depolarization, intracellular calcium and exocytosis in single vertebrate nerve endings. Biophys J 61: 19–30. Lingamaneni R, Birch ML, and Hemmings HC Jr (2001) Widespread inhibition of sodium channel-dependent glutamate release from isolated nerve terminals by isoflurane and propofol. Anesthesiology 95: 1460–1466. MacIver MB, Mikulec AA, Amagasu SM, and Monroe FA (1996) Volatile anesthetics depress glutamate transmission via presynaptic actions. Anesthesiology 85: 823–834. Perouansky M and Hemmings HC Jr (2003) Presynaptic actions of general anesthetics. Contemporary clinical neuroscience, in Neural Mechanisms of Anesthesia (Antognini JF, Carstens EF, and Raines DE eds) pp 345–369, Humana Press, Totowa, NJ. Ragsdale DS, McPhee JC, Scheuer T, and Catterall WA (1994) Molecular determinants of state-dependent block of Na+ channels by local anesthetics. Science (Wash DC) 265: 1724–1728. Ratnakumari L and Hemmings HC Jr (1998) Inhibition of presynaptic sodium channels by halothane. Anesthesiology 88: 1043–1054. Ratnakumari L, Vysotskaya TN, Duch DS, and Hemmings HC Jr (2000) Differential effects of anesthetic and nonanesthetic cyclobutanes on neuronal voltage-gated sodium channels. Anesthesiology 92: 529–541. Rehberg B and Duch DS (1999) Suppression of central nervous system sodium channels by propofol. Anesthesiology 91: 512–520. Rehberg B, Xiao YH, and Duch DS (1996) Central nervous system sodium channels are significantly suppressed at clinical concentrations of volatile anesthetics. Anesthesiology 84: 1223–1233. Richards CD (1998) What the actions of anaesthetics on fast synaptic transmission reveal about the molecular mechanism of anaesthesia. Toxicol Lett 100–101: 41–50. Ruben PC, Starkus JG, and Rayner MD (1992) Steady-state availability of sodium channels. Interactions between activation and slow inactivation. Biophys J 61: 941–955. Schlame M and Hemmings HC Jr (1995) Inhibition by volatile anesthetics of endogenous glutamate release from synaptosomes by a presynaptic mechanism. Anesthesiology 82: 1406–1416. Shahani SK, Lingamaneni R, and Hemmings HC Jr (2002) General anesthetic actions on norepinephrine, dopamine and γ-aminobutyric acid transporters in stably transfected cells. Anesth Analg 95: 893–899. Stuenkel EL and Nordmann JJ (1993) Sodium-evoked, calcium-independent vasopressin release from rat isolated neurohypophysial nerve endings. J Physiol (Lond) 468: 357–378. Tanaka M, Cummins TR, Ishikawa K, Black JA, Ibata Y, and Waxman SG (1999) Molecular and functional remodeling of electrogenic membrane of hypothalamic neurons in response to changes in their input. Proc Natl Acad Sci USA 96: 1088–1093. Taheri S, Halsey MJ, Liu J, Eger EI 2nd, Koblin DD, and Laster MJ (1991) What solvent best represents the site of action of inhaled anesthetics in humans, rats and dogs? Anesth Analg 72: 627–634. Tibbs GR, Barrie AP, Van Mieghem FJ, McMahon HT, and Nicholls DG (1989) Repetitive action potentials in isolated nerve terminals in the presence of 4-aminopyridine: effects on cytosolic free Ca2+ and glutamate release. J Neurochem 53: 1693–1699. Toescu EC and Nordmann JJ (1991) Effect of sodium and calcium on basal secretory activity of rat neurohypophysial peptidergic nerve terminals. J Physiol (Lond) 433: 127–144. Tonner PH, Poppers DM, and Miller KW (1992) The general anesthetic potency of propofol and its dependence on hydrostatic pressure. Anesthesiology 77: 926–931. Topf N, Recio-Pinto E, Black TJJ, and Hemmings HC Jr (2003) Actions of general anesthetics on voltage-gated ion channels, in Neural Mechanisms of Anesthesia (Antognini JF, Carstens EF, and Raines DE eds) pp 299–318, Humana Press, Totowa, NJ. Turner D and Stuenkel EL (1998) Effects of depolarization evoked Na+ influx on intracellular Na+ concentration at neurosecretory nerve endings. Neuroscience 86: 547–556. van Swinderen B, Saifee O, Shebester L, Roberson R, Nonet ML, and Crowder CM (1999) A neomorphic syntaxin mutation blocks volatile-anesthetic action in Caenorhabditis elegans. Proc Natl Acad Sci USA 96: 2479–2484. Wakasugi M, Hirota K, Roth SH, and Ito Y (1999) The effects of general anesthetics on excitatory and inhibitory synaptic transmission in area CA1 of the rat hippocampus in vitro. Anesth Analg 88: 676–680. Wang G, Dayanithi G, Newcomb R, and Lemos JR (1999) An R-type Ca2+ current in neurohypophysial terminals preferentially regulates oxytocin secretion. J Neurosci 19: 9235–9241. Wang XM, Dayanithi G, Lemos JR, Nordmann JJ, and Treistman SN (1991) Calcium currents and peptide release from neurohypophysial terminals are inhibited by ethanol. J Pharmacol Exp Ther 259: 705–711. Weigt HU, Kwok WM, Rehmert GC, Turner LA, and Bosnjak ZJ (1997) Voltage-dependent effects of volatile anesthetics on cardiac sodium current. Anesth Analg 84: 285–293. Westphalen RI and Hemmings HC Jr (2003) Selective depression by general anesthetics of glutamate versus GABA release from isolated cortical nerve terminals. J Pharmacol Exp Ther 304: 1188–1196. Yamakura T, Bertaccini E, Trudell JR, and Harris RA (2001) Anesthetics and ion channels: molecular models and sites of action. Annu Rev Pharmacol Toxicol 41: 23–51. Yarov-Yarovoy V, McPhee JC, Idsvoog D, Pate C, Scheuer T, and Catterall WA (2002) Role of amino acid residues in transmembrane segments IS6 and IIS6 of the Na+ channel α subunit in voltage-dependent gating and drug block. J Biol Chem 277: 35393–35401.